If you’re looking for the biggest thrill in the park, you’ve found it at Taumata Racer® - Hurtle down a 375-foot water slide, around a 180-degree turn, and through tunnels before racing to the line on this high-speed ride. HooRoo Run® - Get your heart pumping as you drop down 80 feet on two enclosed and two open-air slides. Tassie's Twister - A two-person or four-person raft ride that drops you down 75 feet of water before pouring you into a six-story funnel. 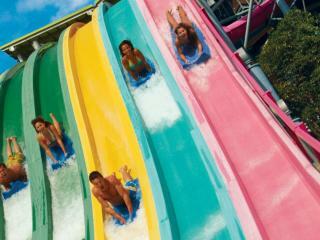 Whanau Way - Experience the twists and turns on four enclosed and two open-air slides. Walhalla Wave® - This 78-foot ride is designed for the whole family to enjoy. The circular family raft sends riders through watery waves and long twists and turns. Big Surf Shores - Get swept up in one of southern California's largest wave pools, with swells reaching up to five feet. Slippity Dippity® - A safe place for little ones to splash around for hours! This ticket gives you a single day entry to Aquatica® California. The Aquatica California One Day Ticket can only be used in the Summer season when Aquatica® California is open. Aquatica® California is only open during the Summer. Aquatica® California is open daily between 24 May to 2 September and weekends only 7-30 September. Tickets are open-dated and can be used at any time during the 2019 season.